Our idea is to remake these colorful, 20# rice sacks, turning them into heavy-weight Tejomai Shopping Totes. Custom order one now! "I've always been interested in craft and recycling," says Tejomai Udatha of Cupertino, CA. "My mother was my inspiration. I still have fond memories of helping in her sewing and simple home improvement projects. 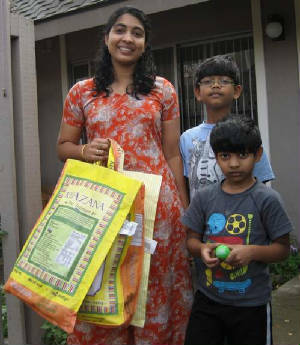 I've been saving a few rice bags, and I was happy to see someone who could understand and appreciate my ideas." Watch for the transformation of these colorful rice bags from India, where Tejomai was born, into unique market shopping totes.